Concrete resurfacing is a process to make the top of concrete look like new without the cost and trouble of tearing out an existing driveway and pouring it again. Resurfacing can be done on all concrete surfaces, but driveways are most often in need because of the wear and tear gone through as vehicles drive over it. Resurfacing a driveway is possible if the existing concrete base is structurally sound. 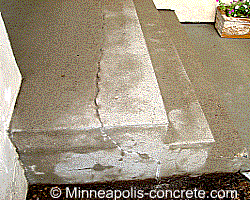 Resurfacing is a great option for concrete that is flaking (spalling), or has surface defects. Make sure the surface is free of all contaminants that could break the bond between the new surface and the existing concrete. This would include paints, oils, dirt, dust, sealers, and form release. To remove these, you or a contractor may sand blast, power wash, shot blast, scarify, or use chemicals to eliminate these potential bond-breakers. If the structure is sound, fill all holes and defects with a patching compound. This is important to do, because the new surface placed over the top will only be about a 1/32 to 1/8th of an inch thick with a maximum thickness of 1/2 an inch. After patching and allowing to dry, use an angle grinder with a diamond cup to grind the patches to match the existing surface. There are many choices in resurfacing compounds. Miracote, Ardex, Quikrete, and Mapei are a few brands that work well. There are directions regarding tools and mixing ratios on the packages of these compounds. Apply the resurfacing compound with a steel trowel on a small section of the driveway. When applying the compound, work from control joint to the next. Slide a concrete broom over the surface in one direction before the product takes a firm set. Because the product dries quickly, it's essential to fill in a small area first and then move on to the next. After the compound has set, seal with a water-borne, breathable concrete sealer to help resist damage from pooling water, salt, oil, staining, and marking. 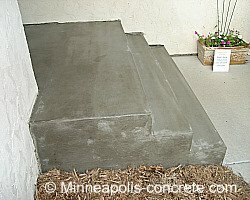 See how to seal concrete. You may update an existing driveway by adding an integral color to the compound mix, or simply staining the resurfacing compound once it has dried and before you seal it. 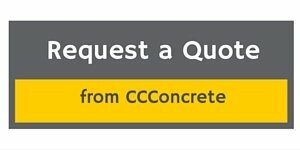 If you live in the Minneapolis and surrounding area, get a free estimate from CC Concrete for concrete driveway resurfacing.